Baltimore oriole; photo by Henry T. McLin on Flickr (noncommercial use permitted with attribution / no derivative works). 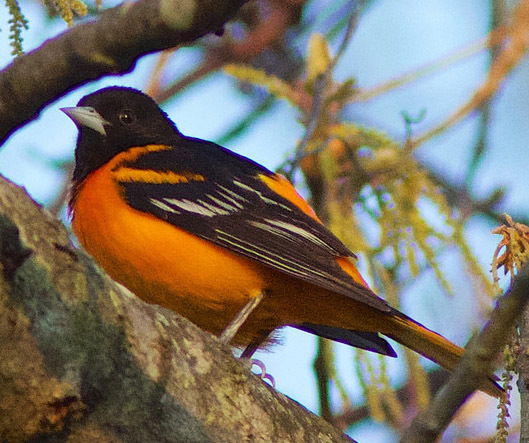 The Baltimore oriole is a strikingly distinctive inhabitant of Maryland's parks and suburban areas, and Maryland birders eagerly await this beautiful songbird's migration each spring. The female Baltimore oriole's feathers are brownish-olive and dull orange, but the male's plumage is black and a brilliant golden-orange, similar to colors in the Calvert shield, which is seen on Maryland's state seal and state flag (and also reflected in the gold and black colors of Maryland's state insect, state flower, and state cat). From Maryland at a Glance; "This similarity (to the colors on the Calvert shield) led to its early association with the name of the Maryland proprietor. In 1698, "Baltemore Birds" were among the "Beasts of Curiosity" ordered sent from Maryland to grace the royal gardens (Archives of Maryland 23: 455-56). In 1894, Baltimore's major league baseball team was named after the bird (The Baltimore Orioles)." Despite its special status, since 1966 (and more rapidly after 1980) the number of Baltimore Orioles has been declining. The loss is attributed to destruction of breeding habitat and tropical winter habitat, and toxic pesticides ingested by the insects which constitute the Baltimore Oriole's main diet." 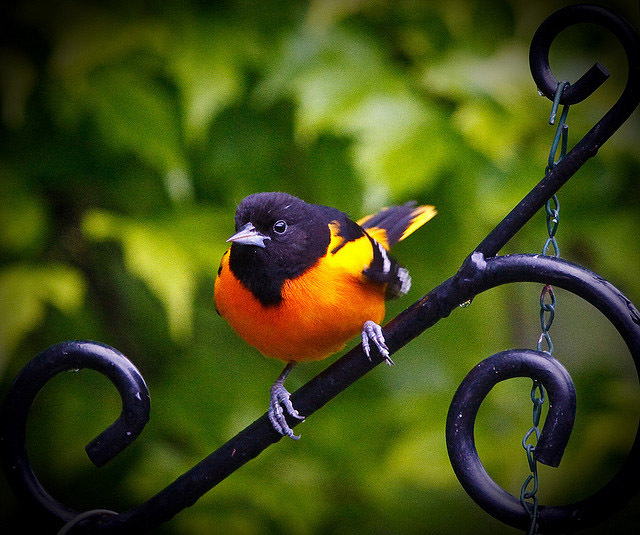 Baltimore oriole; photo by Mike Rodriquez on Flickr (noncommercial use permitted with attribution / share alike).